Securing your luggage with the KF 3 Dial Combination Lock Luggage Strap will grant you a peace of mind and ensure your luggage make it to your destination safely. 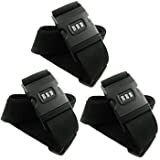 This KF luggage strap is secured by a three-dial combination lock. Lock is preset to 0-0-0, and you can reset it to your own combination code by pressing the reset button inside the lock. The adjustable webbed strap has a maximum length of 78 inches (2 meters), allowing you to wrap it around luggage of different sizes securely, including some very big ones. This entry was posted in Luggage and tagged Combination, Dial, Lock, Luggage, Strap by Perfect Vacation. Bookmark the permalink.